Dubai: The International Monetary Fund’s staff report on the UAE published last week has lauded the efforts of the government in fortifying the long-term public finances, while supporting short-term measures to revive economic growth. According to the IMF, the UAE’s fiscal stance has become more supportive of the recovery with higher government spending. In May 2018, the authorities announced plans for raising investment. Abu Dhabi intends to invest Dh50 billion over three years ($13 billion or 3.5 per cent of the 2017 UAE GDP), augmenting Dubai government’s planned investment of $6 billion for Expo 2020 in 2018-20. Given the supportive environment, non-oil growth is projected to rise to 3.9 per cent in 2019 and 4.2 per cent in 2020 and the overall real GDP growth is projected at around 3.7 per cent for 2019-20. The IMF Staff report supported the authorities’ more accommodative short-term fiscal stance. “Spare capacity, large buffers, and tightening financial conditions warrant a fiscal easing. In Abu Dhabi, finalising and front-loading the stimulus plans while channelling expenditure into areas with high growth multipliers, selecting projects based on rigorous cost-benefit analysis to ensure efficiency of spending,” the IMF report said. While the IMF called on UAE government to abstain from competitiveness-reducing measures, such as wage hikes, to accelerate the recovery and raise medium-term, it pointed to the need for close coordination between fiscal and monetary authorities during the implementation (and eventual phasing out) of the stimulus to mitigate any potential risks to the financial sector and economic growth. Given Dubai’s large public-sector debt, the IMF staff encouraged the authorities to be prudent when implementing recent revenue-reducing measures while containing current expenditure growth and executing the planned investment efficiently. The IMF recommends resuming fiscal consolidation once the recovery takes hold. Large financial buffers allow consolidation to proceed gradually: an average annual rate of 0.5 percentage point of GDP would allow the gap to be closed by 2029, while mitigating an adverse impact on growth. Commending the efforts of the UAE in judicious public spending, the report said the UAE’s large and wide-ranging public investment has created a state-of-the-art infrastructure, attracted foreign talent, improved productivity, and made the country one of the premier destinations for foreign investment. “As a sign of a maturing economy, marginal productivity of investment has declined along with trend in non-oil growth, raising the bar for future policies to deliver a sustained expansion of capacity through technological advancement and reallocation of resources to more productive sectors,” the IMF report said. Staff welcomed the authorities’ intention to contain the government wage bill and other current expenses as a share of non-oil GDP over the medium term, to strengthen the fiscal position while improving competitiveness. Building on progress achieved earlier, continued energy and water subsidy reforms would rationalise private consumption and reduce the burden on public finances. 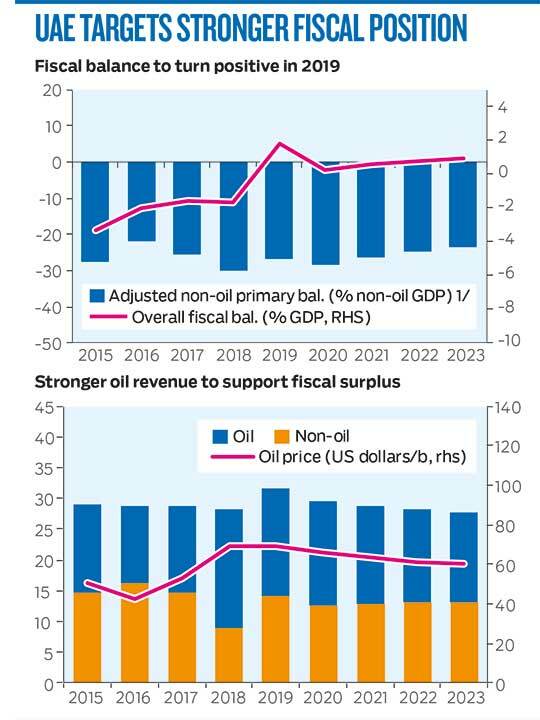 In tandem with efforts to diversify the economy, transforming fiscal revenue systems is important to strengthen the link between non-oil growth and fiscal revenues over time. In this context, staff commended the authorities for their successful introduction of VAT in 2018. To ensure its smooth functioning, staff recommended finalising arrangements for timely distribution of VAT refunds and revenue. In the longer term, consideration could be given to gradually broadening the VAT base and to developing more efficient revenue systems over time. The IMF report called on government to consider a progressive system of corporate taxes replacing the current system of government fees. “While the current system of numerous government fees may have served the UAE well in attracting FDI in the early development stages, it is regressive, and costly to administer. It is also less conducive to SME development and diversification as fixed fees are more burdensome for smaller enterprises,” the IMF staff report said. The authorities have already initiated a comprehensive review of fees with a view to rationalising them. The IMF staff welcomed this step and recommended a complementary study assessing the extent of potential economic distortions from fees and exploring alternative revenue models, such as corporate income taxation, which would be more progressive, easier to administer, and more conducive to SME development.